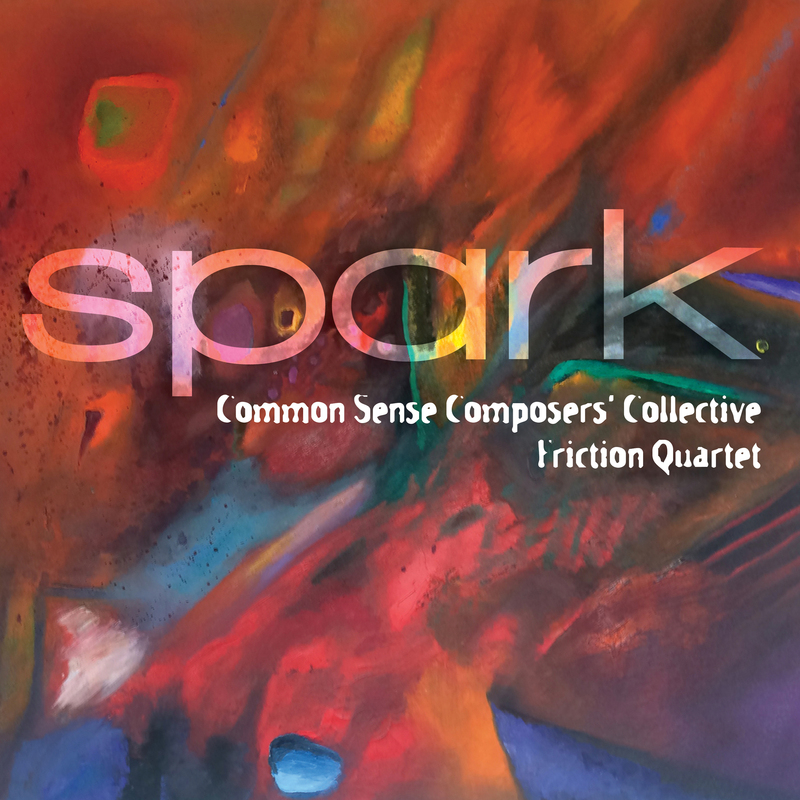 Now in its third decade, the Collective has still got it going on, as its fifth album, Spark, amply demonstrates. It is kindled by the Oakland-based Friction Quartet, that spent many months breathing their own unique fire into the works. The group performs them here as if they had known these compositions all their lives. Their ability to move from virtuosic precision to a deep, timeless, almost telepathic mode of communication is remarkable. The program opens with Marc Mellits’ Five, the beating heart of the album. This gentle lullaby serves as a doorway into a room filled with seven unique (and wide awake) offspring. Some of the composers in the Collective explore a kind of “Post post-minimalism”. In Dan Becker’s Lockdown, unruly rhythmic patterns fiercely try to break out of their metric cages, while in John Halle’s Sphere(‘s), any overt metric pulse disappears into the background while still holding together a swirling series of polyrhythmic phrases – all this in an attempt to exorcise two tunes by the ghost of jazz master Thelonius Monk. Belinda Reynolds’ Open takes another approach, simply letting Minimalist processes become the water that this elegant and beautiful creature swims in. Finally, Randall Woolf’s No Luck, No Happiness pulls both backward and forward in time, aiming to reinvent the Baroque trio sonata with violin, turntables, and drum machine. Works by Melissa Hui and Carolyn Yarnell take a different approach. Here, a patient unfolding filled with rich silences and textural detail hold sway. Yarnell's Monographs invites us to enter a Zen-like austerity which blossoms into heartbreaking lyricism. Hui’s Map of Reality, a set of five short structured improvisations, dives into a deep exploration of the quartet’s sonic possibilities as if searching for the DNA of the musical material itself. Finally, in his piece Trill, Ed Harsh brings together kinetic, rhythmic motion with sonically arresting passages; exploring the impulse to leave and return, over and over again. The Common Sense Composers’ Collective is comprised of Dan Becker, John Halle, Ed Harsh, Melissa Hui, Marc Mellits, Randall Woolf, Belinda Reynolds, and Carolyn Yarnell. The group, now its third decade, has created over 70 new works, released four albums, and produced five new music marathons (Opus415) in the San Francisco Bay Area.